CAPE COD & ISLANDS COUNCIL INC. BOY SCOUTS OF AMERICA and JOHN TRACY WIGGIN v. LAURIE SNOWDEN LEBEL, as trustee of the Asa Eldridge Realty Trust, DOUGLAS LEBEL and KELLY CHILDS RAGUCCI as trustees of the Rachel Thacher Lebel Irrevocable Trust 2005, JAMES QUIRK as trustee of the Abegale Snow Lebel College Fund Trust and trustee of the Rebekah Eldred Lebel College Fund Trust, and WILLIAM HOWES III as Public Administrator of the Estate of Asa Eldridge. By Plaintiff's Notice of Voluntary Dismissal vs. William Howes III (Nov. 20, 2015), by Plaintiff's Stipulation of Dismissal vs. All Other Defendants, assented to by all parties (Nov. 20, 2015), and by the Trial Stipulations Between Plaintiff-in-Intervention, John Tracy Wiggin, and Defendants Laurie Snowden Lebel, Douglas Lebel, Kelly Childs Ragucci and James Quirk Jr., as trustees of the above-captioned trusts (the "trustee defendants") (Jul. 29, 2015), all claims but one in this case were resolved, fully and finally, by dismissal with prejudice. The only one remaining is Intervenor-Plaintiff John Tracy Wiggin's claim to a prescriptive easement over the trustee defendants' land in Yarmouth, which was tried before me, jury-waived. I also took a view. Based on Mr. Wiggin's and the trustee-defendants' stipulations, the testimony and exhibits admitted at trial, my observations at the view, my assessment of the credibility, weight, and appropriate inferences to be drawn from that evidence, and as more fully set forth below, I find and rule that Mr. Wiggin has failed to prove the prescriptive easement he alleges, and thus dismiss that claim, in its entirety, with prejudice, ending the case. These are the facts as I find them after trial, and the legal conclusions that flow from those facts. To establish a prescriptive easement, a claimant must show "the (1) continuous and uninterrupted, (2) open and notorious, and (3) adverse use of another's land (4) for a period of not less than twenty years." White v. Hartigan, 464 Mass. 400 , 413 (2013). See Boothroyd v. Bogartz, 68 Mass. App. Ct. 40 , 43-44 (2007); G.L. c. 187, § 2. The easement is limited to the uses actually made that meet those tests, see Lawless v. Trumbull, 343 Mass. 561 , 562-563 (1962), and to the location and dimensions of those uses. See Boothroyd, 68 Mass. App. Ct. at 45. The claimant has "the burden of proof on each and every element mentioned above," Boothroyd, 68 Mass. App. Ct. at 44, and "[i]f any of these elements is left in doubt, the claimant cannot prevail." Holmes v. Johnson, 324 Mass. 450 , 453 (1949). Because "it is contrary to record titles, and begins in disseizin, which ordinarily is wrongful[,] [t]he acts of the wrongdoer [the claimant] are to be construed strictly and the true owner is not to be barred of his right except upon clear proof." Tinker v. Bessel, 213 Mass. 74 , 76 (1912) (internal citations and quotations omitted). The parties do not dispute that the Disputed Way exists on the ground. Where they differ is in its width and, more fundamentally, whether Mr. Wiggin has any appurtenant prescriptive right to use it in its section over the Lebel parcel. The width of the Disputed Way (which, for reasons that will shortly become apparent, I refer to hereafter as the "path" or "pathway") is not the eight to ten feet claimed by Mr. Wiggin and his witnesses. As convincingly established at trial through the testimony of the trustee-defendants' surveyor, Daniel Ojala, and confirmed by my observations at the view, it is six feet wide. It is a dirt pathway, covered in leaves, with no visible wheel marks or ruts of any kind. It does not follow the contours of the land as is customary of woodland roads [Note 7] but, instead, is unerringly straight. There are no cuts and fills. Rather, the path goes up and down hills, some quite steep, in a straight line without regard to topography. Roots, stumps, and rocks have been left in the path. 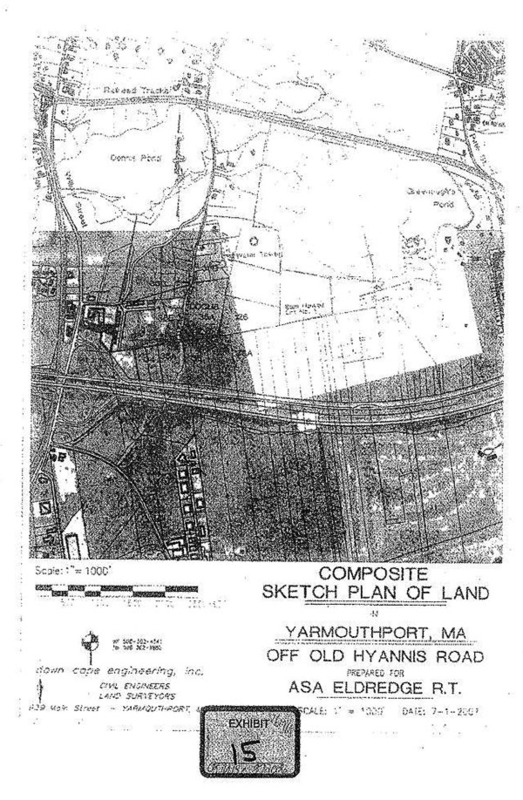 In the section at issue in this lawsuit, the path currently begins at Old Hyannis Road (a public road) on the west and then proceeds east through the Lebel Parcel, the Wiggin Parcel, and the Boy Scouts' land that abuts Mr. Wiggin's, all of which are undeveloped woodland. The testimony differed on the condition of the path between the time of the easement's abandonment and the present. Ms. Lebel recalls walking in the area in the 1960s and not noticing anything other than narrow, deer-type trails. Mr. Wiggin claims the path was sufficiently wide and well-maintained for him to drive over in his Volkswagen Jetta but, as more fully discussed below, I do not believe him. What I find likeliest is this. The area is heavily forested so that undergrowth has a difficult time getting established and then growing to any size. An airplane crashed in an area accessed by the path in 1979 (the crash site is on the flightpath to Hyannis Airport), and the rescuers used the path to get to the crash, likely brushing it out at that time. The crash site is on the Boy Scouts' land, and the Scouts maintain the trails in and around their property. Once this pathway was widened by the rescuers, the Boy Scouts saw it and thereafter occasionally used a Graveley on the path and removed fallen trees from across it. [Note 12] As previously noted, none of this, nor any maintenance of any kind, has ever been done by Mr. Wiggin nor anyone with an interest in his property. [Note 13] Thus, none of these activities were attributable to him or his land. I thus turn to those that are. Mr. Wiggin's account begins with his claim that, shortly after purchasing the Wiggin parcel, he drove to where the path intersects with Old Hyannis Road and then drove across the path through the woods in his VW Jetta as far as the Boy Scouts' land. [Note 15] I can believe he drove to the path's intersection at Old Hyannis Road, but I do not believe he drove his car on the path, then or ever. [Note 16] Driving on that part of Old Hyannis Road was difficult from the 1960s through the mid-2000s. Once a main thoroughfare from the north-side communities of the Cape to the south, it became a dead-end when the Mid-Cape Highway (Route 6) was constructed, cutting off its continuation to Hyannis and the other south-side towns. Once cut off, Old Hyannis Road rapidly deteriorated and was a deeply rutted dirt road only 8 feet wide until its widening and paving in 2004. As an isolated dead end, it became a dumping ground for tires, old refrigerators, other broken household appliances, and construction debris, all of which made it even more difficult for driving. Driving the length of the path would have been impossible for a non-high clearance, non-four wheel drive car like the VW Jetta. As previously noted, a witness from the Boy Scouts said that he had traveled on it on a mini-tractor (23hp), and believed a pick-up truck had used it on one occasion. Having seen the narrow, six-foot wide path with its inclines, roots, stumps, and rocks, I am skeptical of the pick-up truck story [Note 17] and, even if true, am not surprised that it was a one-time event. No one with concern for their vehicle's undercarriage would have driven along it. The trash dumped at its beginning points on Old Hyannis Path would have been a major obstacle just by itself and, of course, the Boy Scouts' installation of cables across the path's entrances in 2002 prevented any vehicular access thereafter. Moreover, the absence of wheel marks and scars on the high roots in the pathway is convincing evidence that the use of the path, by anyone, was pedestrian-only, with the only exception being the Boy Scouts' sporadic Graveley brushing-out and removal of fallen limbs and trees. Mr. Wiggin admits that he never posted a sign of any type anywhere on the path, not even a directional one at its intersection with Old Hyannis Road (i.e., a sign with his name or the property's address on it, with an indication that the property was down the path). Neither of his deeds contains an easement or reference to an access route, and he was never told of one by his seller. The plan he had done of his property shortly after his purchase does not show any path or road going to or through it. He never built anything on his land (it has always been vacant woodland), and never had a mailbox anywhere on his site or at the intersection of the path with Old Hyannis Road. He claims to have walked along the path to reach his property, but admits that he never did so more than once or twice a year, and not at all from 1995- 2002 when he was living off-Cape. He never walked the path when there was snow on it, which would have shown his footprints. He admits that no one ever saw him, and that he left nothing to indicate that he had ever been there  not even a sign on his own land. He never told the owners of the Lebel parcel that he was walking across their land, either orally or in writing. As previously noted, he never made any changes to the path nor did maintenance of any kind  not even to remove fallen limbs or trees. Deer leave more evidence of their passing. of an adverse claim of title"); Cook v. Babcock, 65 Mass. 206 , 210 (1853) ("[A]cts must not be merely occasional, partial or temporary in their nature. "); Houghton v. Johnson, 71 Mass. App. Ct. 825 , 842 (2008) (intention of claimant "must be manifest by acts of clear and unequivocal character that notice to the owner of the claim might be reasonably inferred"). For the foregoing reasons, Mr. Wiggin's claim of an appurtenant prescriptive easement over the trustee-defendants' land (the Lebel parcel) is DISMISSED, WITH PREJUDICE. All of Mr. Wiggin's other claims were expressly waived, so they are DISMISSED, WITH PREJUDICE as well. Judgment shall enter accordingly. That judgment shall also reflect that all of the plaintiff's claims were previously voluntarily dismissed, with prejudice, bringing this action to a full and final resolution. [Note 1] The Lebel Parcel is Lot #36A on Trial Ex. 15. [Note 2] Trial Stipulation 6 (Jul 29, 2015). [Note 3] The Wiggin Parcel is Lot #126 on Trial Ex. 15. [Note 4] Trial Stipulation 6 (Jul. 29, 2015). [Note 5] Trial Stipulation 5 (Jul. 29, 2015). [Note 6] Trial Stipulation 7 (Jul. 29, 2015). [Note 7] Woodland roads were generally created for the purpose of accessing woodlots and then removing wood from them. As such, they either curve along the contours of the land, or make cuts and fills in hills and depressions to make it easier to transport heavy logs. [Note 8] The easement over the Lebel parcel was granted December 23, 1907. It only benefits the telephone company, no one else. [Note 9] Having seen the topography and condition of the path, this inspection and maintenance could only have occurred on foot or through the use of high-clearance four-wheel drive vehicles, probably tractors. [Note 10] That is the date of a land court registration plan (14095A) of an adjoining parcel over which the easement ran. Had it been an active easement, the plan would have showed it. See G.L. c. 185, §§ 46 & 47. The plan does not. [Note 11] There was a another telephone/telegraph easement in the area, 160 feet to the south and parallel to this one, cut, used, and then also quickly abandoned, which Mr. Ojala referred to as the Marconi Company easement. It is in a different location than the pathway at issue in this lawsuit. Some of its wires are still visible, tangled in the trees. [Note 12] The Boy Scouts' potential claim to a prescriptive easement over the path in its section on the Lebel parcel was not at issue in the trial. As previously noted, the Scouts previously dismissed all their claims in this lawsuit, with prejudice. Even had they not, it is doubtful they could have established prescriptive rights over this section. Their Graveley activity has never been more than a few times per year and is not particularly visible given the regularly fallen leaves. There have only been a handful of trees that have fallen across the pathway over the years, and there was no evidence that these trees were of any noticeable size. A witness from the Boy Scouts testified that he drove a mini-tractor (23 hp) over the pathway on one occasion, and that a pick-up truck driven by Scout volunteers came from that direction on another, although he never personally saw it on the path. Such sporadic actions are not sufficiently continuous, open or notorious for a prescriptive claim. The Scouts' one clearly open, notorious, continuous and adverse activity was their installation of cables across the path in the early 2000s to stop garbage dumping from trespassers. Those cables, however, have not been there for more than twenty years. [Note 13] The parties stipulated that the Boy Scouts have never had an interest in the Wiggin parcel. [Note 14] Mr. Wiggin testified that he acquired a part interest in the property in the first deed, and a full interest in the second. Both deeds recite consideration of less than $100. [Note 15] He claims that his first visit to his newly-acquired property was along the path by foot, but that he began driving along it shortly thereafter. [Note 16] Mr. Wiggin admits that he never took a passenger along on any of these alleged drives, and never saw anyone else on the path at any time he was on it, walking or driving. [Note 17] The witness never saw the pick-up truck actually on the pathway on the Lebel parcel. He only saw it coming from that direction. It is thus likely that the pick-up started on the Boy Scouts' land (whose vehicular access is from a public road in the opposite direction), nosed down the part of the path on the Boy Scouts' and (perhaps) Mr. Wiggin's land, and then turned around when it came to one of the path's steep inclines or rocked/rooted areas without ever reaching the Lebel parcel. If the pick-up did start at Old Hyannis Road, it would only have continued driving to the Boy Scouts' land because it was difficult or impossible to turn around, with the driver vowing never to go that way again.